The circulation for the Irish Independent, Irish Times, Examiner, Herald and Echo are not broken out M-F and Saturday. The papers that are audited monthly do break out their circulation by day (M-F and S) and therefore it is possible to estimate the revenue the brand generates – at the till – every week. 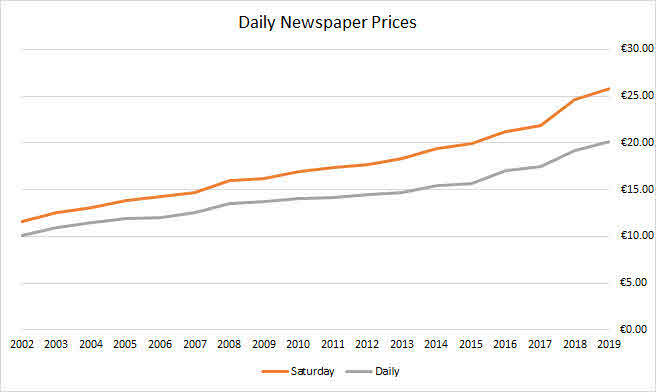 As there is only a M-Sat figure for some papers, the revenue is estimated from that single figure and the price of the M-F edition – their Saturday editions are, in many cases better sellers and command a premium price over the M-F edition. Therefore their revenue figures are, most likely, underestimated in the table below. 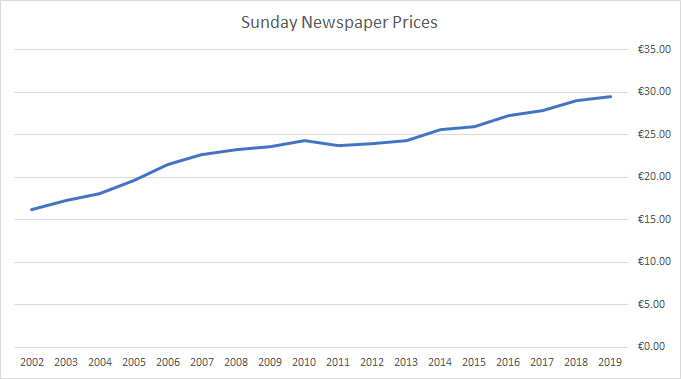 The circulation for the Irish Independent, Irish Times, Examiner, Herald, Echo, Sunday Independent, Sunday World and Business Posts are Second Half 2018 and the other papers are January 2018. In order to estimate revenue – bulks have been stripped out of titles that carry them.